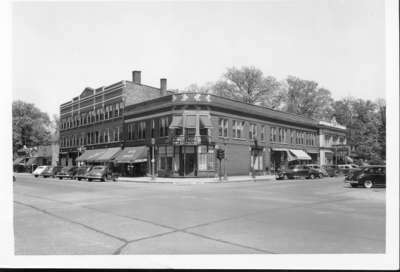 View of the intersection of Wilmette and Central Avenues looking north. Visible to the east is the marquee of the Wilmette Theater which is showing Good News, a film starring June Allyson and Peter Lawford; a barber shop; Schultz & Nord Dry Cleaners on Central Avenue with Wilmette Stationers around the corner on Wilmette Avenue. A note on reverse incorrectly identifies the location as the southeast corner of the intersection.